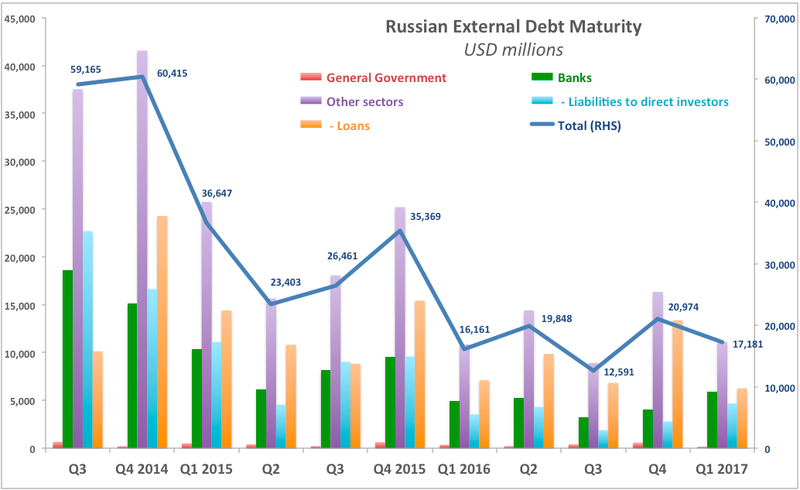 Readers of this blog would have noted that in the past I referenced Russian companies cross-holdings of own debt in adjusting some of the external debt statistics for Russia. As I explained before, large share of the external debt owed by banks and companies is loans and other debt instruments issued by their parents and subsidiaries and direct equity investors - in other words, it is debt that can be easily rolled over or cross-cancelled within the company accounts. This week, Central Bank of Russia did the same when it produced new estimate for external debt maturing in September-December 2015. The CBR excluded “intra-group operations” and the new estimate is based on past debt-servicing trends and a survey of 30 largest companies. 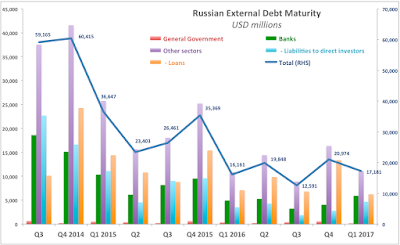 As the result of revisions, CBR now estimates that external debt coming due for Russian banks and non-financial corporations will be around USD35 billion, down on previously estimated USD61 billion. CBR also estimated cash and liquid foreign assets holdings of Russian banks and non-bank corporations at USD135 billion on top of USD20 billion current account surplus due (assuming oil at USD40 pb) and USD14 billion of CBR own funds available for forex repo lending. 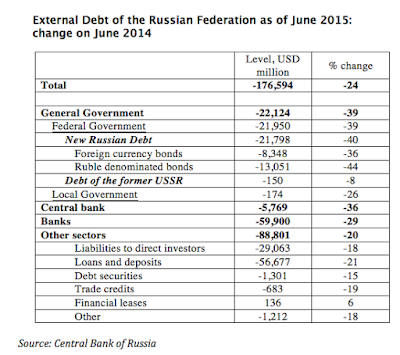 As the above table shows, in 12 months through June 2015, Russian Total External Debt fell 24%, down USD176.6 billion - much of it due to devaluation of the ruble and repayments of maturing debt. Of this, Government debt is down USD22.1 billion or 39% - a huge drop. Banks managed to deleverage out of USD59.9 billion in 12 months through June 2015 (down 29%) and Other Sectors external liabilities were down USD88.8 billion (-20%). 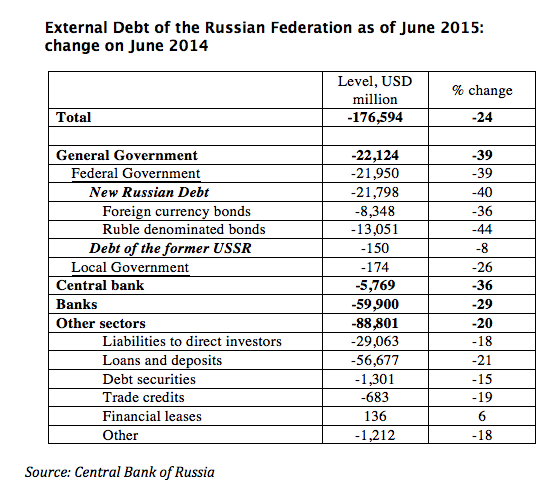 3) Overall longer term improvement in Russian debt exposures.